Every hitter that has spoken to us about the 2018 Easton Stealth Hyperlite loves the two piece feel and ultra balanced. It is clearly designed for the younger hitter that wants as much bat per swing speed as possible. Don’t expect to hit a lot of home runs with this bat. But, you can expect… Jump to the full review. We aren’t the only ones to have information about the Stealth Hyperlite. Other places, in particular those who sell bats, usually have a boiler plate write up on the specs of a bat. Many of those we reference to make sure we are seeing what we should be. Here are some more references for the 2018 Easton Stealth Hyperlite review. Every hitter that has spoken to us about the 2018 Easton Stealth Hyperlite loves the two piece feel and ultra balanced. It is clearly designed for the younger hitter that wants as much bat per swing speed as possible. Don’t expect to hit a lot of home runs with this bat. But, you can expect to increase the odds that you’ll find the barrel. This bat swings too light to create serious damage at the plate. Bigger, stronger and more advanced hitters will wish it had more gumption. But, the new or small travel ball player that needs as much bat speed as possible will like this bat. The price point is more reasonable too although it has many of the same features as bats that are almost twice the price. 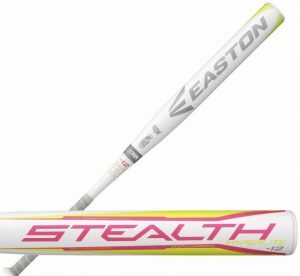 If you want a little more girth check the Easton Stealth Flex. There are virtually no changes between this bat and the previous year. Both are drop 12's with an ultra light swing and a two piece composite structure. It uses the same TCT composite and CXN Connection. It is, aside from the paint job, it is virtually the same. In the two piece composite fastpitch space with less than a $200 budget we can’t think of very many bats. DeMarini has a Sabatoge that is well regarded. Otherwise, if you want a two piece composite bat then expect to pay a lot more than the price of the Easton Stealth Hyperlite. The Blue and Black Easton Ghost Fastpitch bat is an ASA approved (girl’s fastpitch) bat. We review that bat, the Easton Ghost ASA bat below. The gold version, which we review here is a USSSA only version. The 2018 Easton Stealth Hyperlite is a two piece composite bat. Built with a 2 1/4 barrel (because it is fastpitch afterall) the Stealth Hyperlite is a drop 12. The drop, you should know, is the numerical differences between the length and the scale weight of the bat. Since the Stealth Hyperlite is a drop 12 you can expect the 32 inch bat to weigh 20 ounces. Do note, the scale weight is not the same as the swing weight. Swing weights for fastpitch bats are discussed here. The 2018 Easton Stealth Hyperlite is a drop 12 bat only. It comes in 28 and 33-inch lengths.